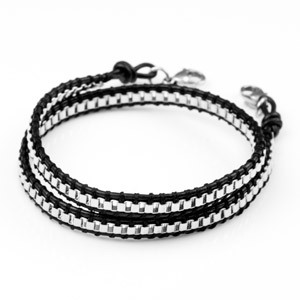 Stainless Chain Wrap Bracelet is available in 12 and 15 inch lengths (measured from clasp to clasp). They are made with stainless beads, leather, and stainless steel lobster clasps. When combined with an ID tag, the bracelet should wrap around the average-sized arm two times. Tag not included - please order separately. (For the small wrap bracelet: With a 2 inch, 1 5/8 inch, or 1 1/2 inch tag, bracelet fits 5 1/2 - 6 inch wrists. With a 1 inch tag, bracelet fits 5 1/2 - 5 3/4 inch wrists. With a 3/4 inch tag, bracelet fits 5 - 5 1/2 inch wrists.) (For the large wrap bracelet: With a 1 5/8 inch or 1 1/2 tag, bracelet fits 7 - 7 1/2 inch wrists. With a 1 inch or 3/4 inch tag, bracelet fits 7 - 7 1/4 inch wrists. With a 2 inch tag, it will not reasonably fit any wrist size.) NOTE: Bracelet will attach to any of the tags you will see on the next page once you add item to cart.